Rest assured that you will fail. Now that that’s out of the way consider this: You will fail at some things in life, just as many people do. But failure teaches you how to improve, and revise your strategy and actions so that you will eventually succeed. Some things in life are worth failing at. For example, bad ideas, activities that don’t build on your strengths, and projects that may not benefit society or may be unprofitable are probably better left undone. Don’t be afraid to scrap the ‘losers’ and start over with a ‘winner’. Find a ‘winner’ and stick to it. Do what you believe in your heart will get you the success. Qualify your ideas and goals with research, tests, practice, and other things. Go with it! The ‘Waterboy’. 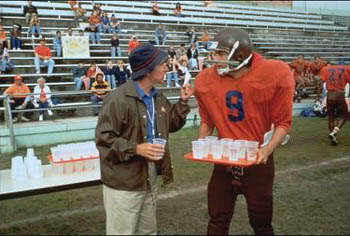 Played by actor Adam Sandler, the waterboy worked the sidelines of his football team, running drinks to the players. He eventually discovered he had a great tackling ability and soon became a member of the team. Albert Einstein. He was a physicist who did poorly in school, and whose parents thought he was mentally retarded when he was young. Michael Jordan. He was cut from his high school basketball team for ‘lack of skill’. Thomas Edison. When he was young he was told by his teacher he was too stupid to learn anything. He eventually tried more than 9000 experiments before he created the light bulb. Bill Gates. He was a Harvard University dropout before going on to develop Microsoft. Abraham Lincoln. He received no more than five years of formal education. His family and neighbors considered him lazy growing up. And he had more than 12 major political failures before he was elected the 16th President of the U.S.
Sir Isaac Newton. He was one of the greatest mathematicians/physicists/astronomers of his day, and was renowned for his theory on gravity. However, he did so poorly in grade school when he was younger his teachers thought there was no hope for him. He was not born a genius as many believe! Ludwig van Beethoven (‘Beethoven’). He was told by his music teacher he was ‘hopeless’ as a composer (prior to launching his career). During his career he lost his hearing, but still created great music! Steven Spielberg. He dropped out of junior high school. He went back and was placed in a learning disabled class before completely dropping out of school for good. Now he is one of the greatest directors in American History. Henry Ford. He failed at his first two automobile companies before he developed Ford Motor Company. He became one of the top three most famous and richest people in the world in his day.